1. Why do you protest against fracking in NY? I protest against fracking because I know a lot of people, and places like PA, where communities have been ruined and water quality (the most important there is) has been destroyed. In New York, many people have worked tirelessly to maintain the moratorium that’s in place here against fracking. Pennsylvania wans’t as lucky, but in their case it is still imperative that we roll back their fracking projects, and there is so much dirty money involved, the task will be very difficult. 2. Please describe how you felt before, during, and after the climate march. Before the march, I didn’t know quite what to expect, but I determined to attend and do my part, hoping for the best. During the march, there was a huge amount of excitement in the air, and as I walked with my friend, Allan and my niece, Eva, I felt the momentum of the occasion and it carried us all the way to the end. The whole day felt like it took one hour. 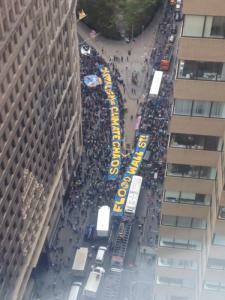 After the march, I continued to feel excited, and went the next day to the Flood Wall Street protest in downtown Manhattan where many of the same topics were being discussed. Now that these protests are over, I have been getting involved in different anti-fracking causes, and I believe one of the most important results that has to come out of this is a wave of new and enthusiastic volunteers since we need the manpower! 3. Was this really the biggest march in the world for this cause? How many people were there to your knowledge? It was huge! I’ve heard anywhere from 310,000 to 400,000. The next time we have a march like this, I would love the number to reach one million, making a bigger and bigger statement. 4. Organizing this must have been a huge challenge; who organized this march? I can’t take credit for that. I know a lot of people who have dedicated their lives to this, and have basically been planning this moment in time for the past 5 years, in some cases since the 60’s. My friend Jenny Urfer has long been my window into this wonderful world; it is because of her that I have had such direct access to this world, and she is a great resource for anyone who wants more information or to get involved. I think that’s a difficult question. A lot of people who care and want to see a change are nevertheless stuck in their positions within the system (I believe this is also true for a lot of finance people on Wall St. ), and I understand the unwillingness to operate justly within an unjust system. If Leonardo didn’t have such “boatloads” of money and clout, he wouldn’t be able to make such an audible statement. 6. What do you think the impact of the march on policies, companies and the public will be? We can only hope that we are moving into a new era of complete infrastructure and energy generation systems. I personally embrace the concept of coding a whole range of robot/drone machines to handle a lot of the big scale tasks involved, and overall I am quite optimistic about the socioeconomic state of the future.